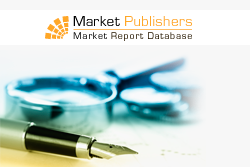 New market study “Research Report on Chinese Bio-Pharmaceutical Industry, 2012” drawn up by China Research and Intelligence (CRI) has been recently published by Market Publishers Ltd. The study finds that last year the sales revenue of the bio-pharmaceutical sector in China surpassed CNY 160 billion, accounting for less than 15% of the total sales revenue of pharmaceutical industry. China’s biological product industry is an emerging one with just over twenty years of history. Last year, the sales revenue of the bio-pharmaceutical sector in China surpassed CNY 160 billion, accounting for less than 15% of the total sales revenue of pharmaceutical industry. The products are mostly concentrated in low-end generic vaccines, blood product industry, and technological barriers are not high. Also, the country’s bio-pharmaceutical industry is still mainly represented by small and medium-sized enterprises, and the market concentration rate is low. However, driven by positive factors like rapid growth of Chinese economy, rising of residents' income and improving of residents' cognition and needs for biopharmaceuticals, the market of China’s bio-pharmaceutical industry is gradually enlarging and the status in the national economy is constantly improving, with the industry expected to eventually hold great investment potential going forward. New market study “Research Report on Chinese Bio-Pharmaceutical Industry, 2012” drawn up by China Research and Intelligence (CRI) has been recently published by Market Publishers Ltd.
development trend of bio-pharmaceutical industry. 5.1 Hualan Biological Engineering Co., Ltd.
5.2 Shanghai Kehua Biological Engineering Co., Ltd.
5.3 Beijing Tiantan Biological Products Co., Ltd.
5.4 Beijing SL Pharmaceutical Co., Ltd.
5.5 Daan Gene Co., Ltd.
5.6 Shanghai RAAS Blood Products Co., Ltd.
5.7 Chongqing Chifei Biological Products Co., Ltd.
5.8 Tonghua Dongbao Pharmaceutical Co., Ltd.
More new market studies by the publisher can be found at CRI page.